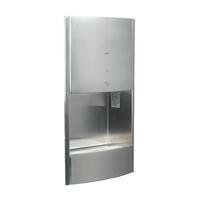 Save space and dial up the style in your washroom with these recessed hand dryers. Engineered for environments where good looks and clever design are everything, these dryers work hard and blend in beautifully. Visible – but extremely subtle – the contemporary elegance of these recessed dryers comes from their super slimline shapes and chic, stainless steel finishes. Protruding by a matter of a few millimeters, they fit into the tiniest of recessed wall-spaces. This enhances the interior of your bathroom and maximises the space, without imposing on the overall aesthetic. 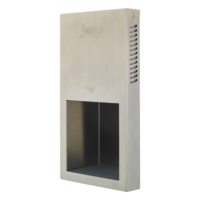 Above all, you can count on recessed dryers to be resilient – from accidental knocks to full-blown vandalism, the vital internal components remain protected by the surrounding wall alcove and robust steel casing. Practically impossible to pull out and steal, the flush-fitting nature of these models keeps them safe from thieves. These are the only wall-recessed dryers on the market to collect waste water from the hands. Rather than leaving dirty streaks down your walls, they blast water from the hands at high speed, then store it discreetly within a sealed collection tank beneath the unit. Easy to remove, wash and replace by hand, the sealed water tanks counteract the build-up of stagnant moisture, helping to keep your bathroom fresh and odour-free.